Learn How to Play "Sultans of Swing"
British rock band Dire Straits sure served up a winner with their 1978 self-titled debut album. The first single, "Sultans of Swing," not only has become a standard of rock radio but also has been widely regarded as containing two of the finest guitar solos in rock history, courtesy of the great Mark Knopfler. In our new G-Plus Song lesson, instructor Doug Boduch walks you through every chord, riff, and lick needed to make your guitar cry and sing—including the outro salvo of spine-tingling arpeggios. Being born in Seattle, in 1991, you might think guitarist Joshua Ray Gooch was destined for a musical career in grunge. But it was the highly melodic and improvisational work of the Allman Brothers Band that made its indelible mark on Gooch’s young ears. Even more important, the guitarist recognized early on that the Allman-style approach of playing in the moment and creating singable melodies, rather than just playing licks, is a timeless one that translates across all musical styles. It’s a lesson that has already helped the 24-year old Gooch attain an impressive level of success as a session and touring guitarist. When approached about your recent Lead Guitar Licks book/video project for Hal Leonard, what did you think? I was very excited, maybe a little overwhelmed—not fearful, but on the verge. It was a huge thing for me. I didn’t really take lessons; I learned from Hal Leonard books and guitar magazines. Ninety-nine percent of my learning was in my room, playing punk songs, metal, and then more technical stuff, but almost all of that material came from going to Guitar Center to buy guitar books and instructional DVDs. What was your approach to the book? I wanted to make it different, something a little more of a conceptual take on improvisation rather than, “Here’s 20 awesome licks.” Basically, I wanted to incorporate how—not just what—I learned into the book. Did you have any teaching experience? I started teaching a year after I started playing, around freshman year of high school. I had a couple of students all through high school—essentially, just enough to make money to purchase more books and videos for me to learn from. But I realized quickly that I loved doing it—not just seeing someone else succeed but what I learned about my own playing, like noticing bad habits. You cover a variety of styles in your Lead Guitar Licks lessons. What’s your favorite style to play? The Allman Brothers Band had a huge influence on the book. A lot of what I learned from them had to do with building motifs, how to develop a tiny idea into a wellspring of music. And that’s what the book does: I take a lick, and then expand on it, teaching several variations on the original. How did your professional playing career get started? While living in San Diego, I found out that a lady at my dad’s job knew Gregg Allman as well as producer Johnny Sandlin, who’d worked with the Allmans, and gave me Johnny’s contact info. He told me to send him a demo—which I didn’t have, so I went to the local Boys & Girls club and recorded myself jamming to backing tracks and sent them. He then asked me to fly to Alabama to record on some of his projects. He also asked if I played slide guitar, and I said yes, but I didn’t. So I spent two months learning slide guitar, practicing 9-10 hours a day, so I could get the gig. I moved back to California, and my parents said I should enter King of the Blues. I had done it the year before I left, got to the second round, and lost. So after that and the Alabama thing, I really wasn’t interested in doing it again. To me, guitar playing is about music, not a competition. But my parents convinced me to give it another shot. Over the course of the next four months, the contestant pool went from 3,500 to 5, and everyone was positive and cool—no negativity—so it turned out being a good experience. And that opened another door for you, right? The night they announced winner, rock photographer Robert Knight handed me his card and asked me to call him the next day. He had worked with B’z, which was sort of the Aerosmith or U2 of Japan, and he gave them my name to be their touring guitarist. I got an audition, filmed a video with the drummer and bassist, and two weeks later they called to say I got the gig. That was when the realization hit that I could actually make a living at music. I went from playing bars in San Diego to playing Budokan three nights in a row. I toured with B’z for 3 or 4 months, and then moved back home with my parents, taking the trash out, and whatnot. It was too weird, so I moved to Los Angeles to get a feeling for how the business worked there, and I eventually got an audition to tour with Beth Hart for the record she did with Joe Bonamassa. Then, while I was out with Beth, I got called for an audition with Shania Twain. Did you have to woodshed your country chops? Yeah. I wasn’t a country player or listener at the time, but now I love it. Learning to play everything exactly like the record was also a new world for me, because the Allman Brothers improv approach was my thing. I now had to get into the head of the guitarist who originally played the part, rather than just doing my own thing. I also learned how important the parts are to the music. The genius of Mutt Lange (Shania Twain’s producer) was just that—parts. Take any part away, and the music loses its impact. And I’d never taken the time to appreciate that before, the “calculated” way in which Mutt sees the production. The production, though, is irrelevant without good songs, and Shania’s songs are A+ material, even just played acoustically. So the Shania gig’s been good. It’s been incredible. Playing with an artist as big as she is, with someone who’s played the Super Bowl and sold over 100 million albums, is just beyond words. 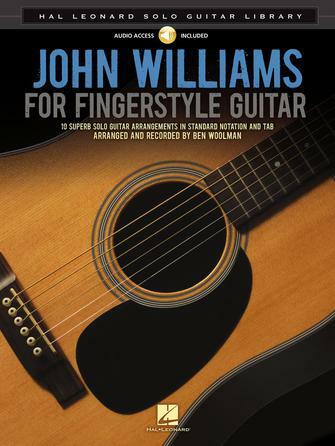 Earlier this year, acoustic guitarist and instructor Ben Woolman took on the exciting task of arranging some of John Williams's greatest film compositions for solo guitar, including three unforgettable themes from Star Wars. With the release of Star Wars: The Force Awakens coming out this week, what better time to woodshed these tracks from the film scoring legend? Be sure to check out Woolman's arrangements of other Williams themes from E.T., Close Encounters of the Third Kind, and more right here. You can also purchase the full transcription book. Click on the cover image for more info. Scott Weiland, the former singer of Stone Temple Pilots and Velvet Revolver, reportedly died in his sleep Thursday night while on tour with his band The Wildabouts, in Bloomington, Minnesota. He was 48. Weiland formed Stone Temple Pilots with brothers Robert and Dean DeLeo. The band soon found huge success with hits like "Plush," "Interstate Love Song," "Vasoline," and "Trippin' on a Hole in a Paper Heart." In 2002, Weiland joined former Guns N' Roses members Slash, Duff McKagan, and Matt Sorum, to form Velvet Revolver. The band released two albums—2004's Contraband and 2007's Libertad—which found great success on the strength of mainstream rock hits like "Slither," "Fall to Pieces," and "She Builds Quick Machines." Weiland is survived by his wife, and two children from a previous marriage. Widely considered one of the best blues guitarists in the world, Kirk Fletcher has commanded the respect and acclaim of critics, peers, and guitarists all across the globe. Fletcher recently filmed his new Burning Blues Guitar instructional project for Hal Leonard, providing 12 brand-new lessons for us at GuitarInstructor.com, including rhythm and lead approaches for Chicago blues, Texas blues, funky blues, slow blues, and more. The video below contains just a small sample of Fletcher's beastly blues rhythm chops.